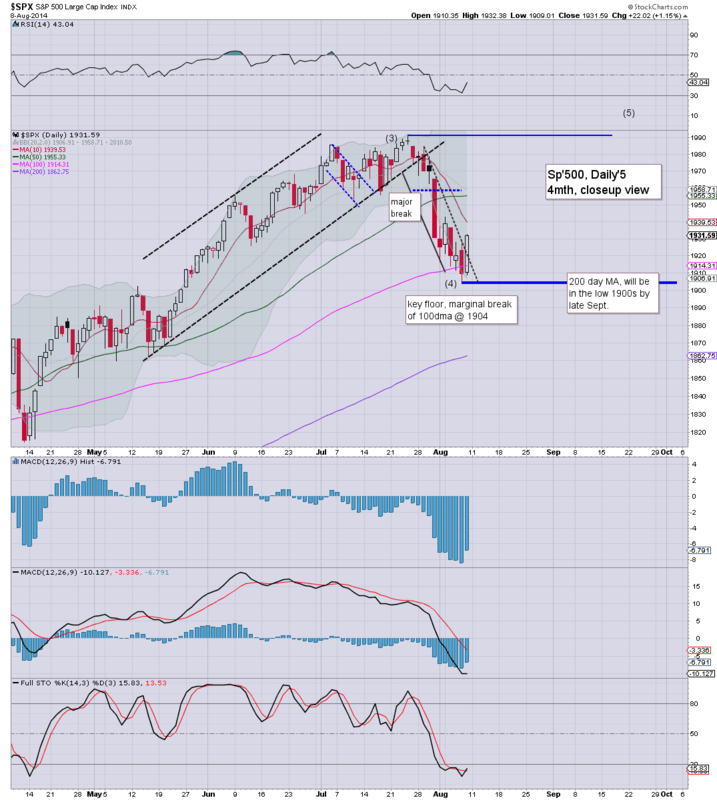 Despite the recent declines, US indexes are still generally holding within their broader upward trends. 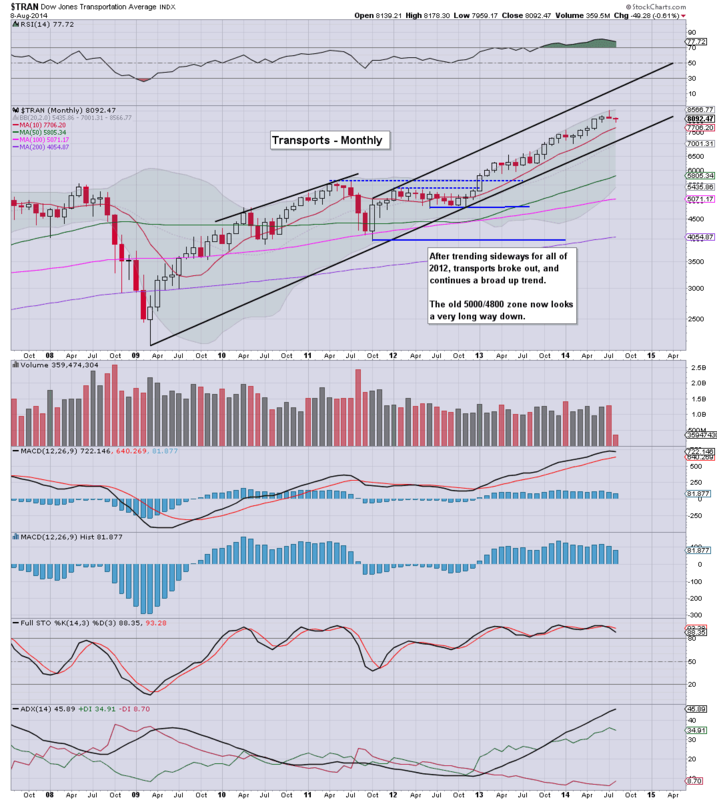 The R2K and Dow are notably weak, but along with the rest of the market, both have viable upside into September. With the Friday gain of 22pts, the sp'500 currently has a fractional net August gain. Underlying MACD (blue bar histogram) cycle continues to tick lower, and at the current rate, the sp' will turn negative cycle at the start of September. For the equity bulls out there, the upper bollinger @ 2042 marks the 'best case' upside for Sept/October. Despite the pull back from 1991, equity bears are still struggling to break the primary trend, and the important 10MA is some 50pts lower. 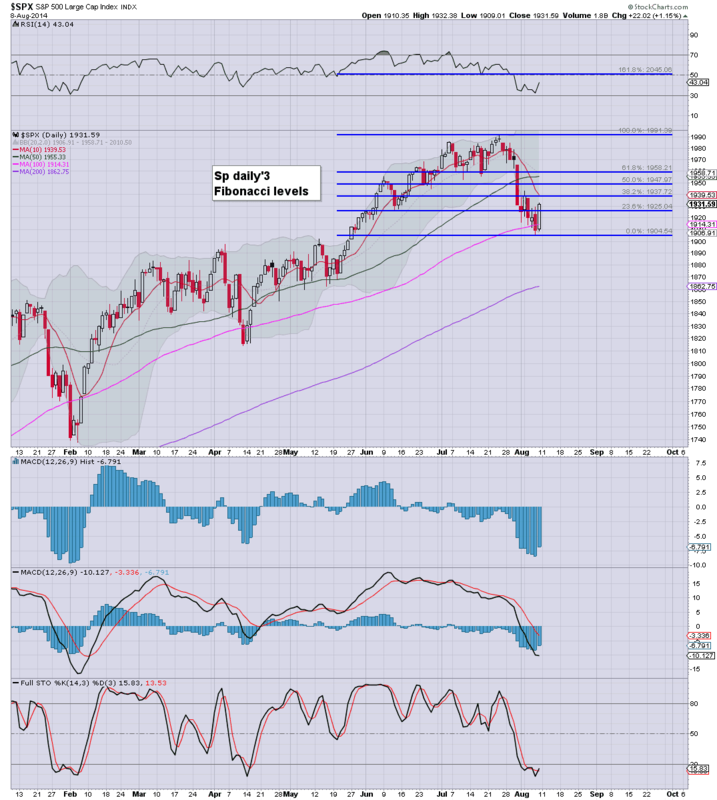 The Nasdaq is very close to the post 2009 highs. There is viable upside to the 4700/800s in Sept/Oct. 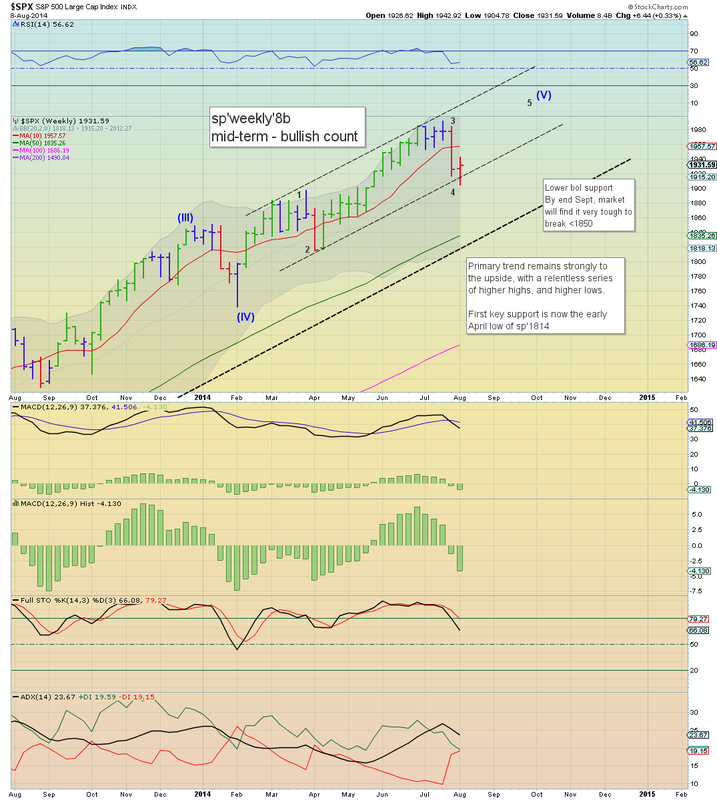 At the current rate, the MACD cycle will see a bearish cross at the start of October. The mighty Dow is currently a touch lower for the second consecutive month. Underlying MACD cycle is now negative for the first time since Dec'2012. We have a break of the rising trend from the 2009 lows, although this has occurred a few times.. with most chartists (myself included) just widening the up channel. It is highly notable that the lower monthly bollinger is now almost at the 14k level. 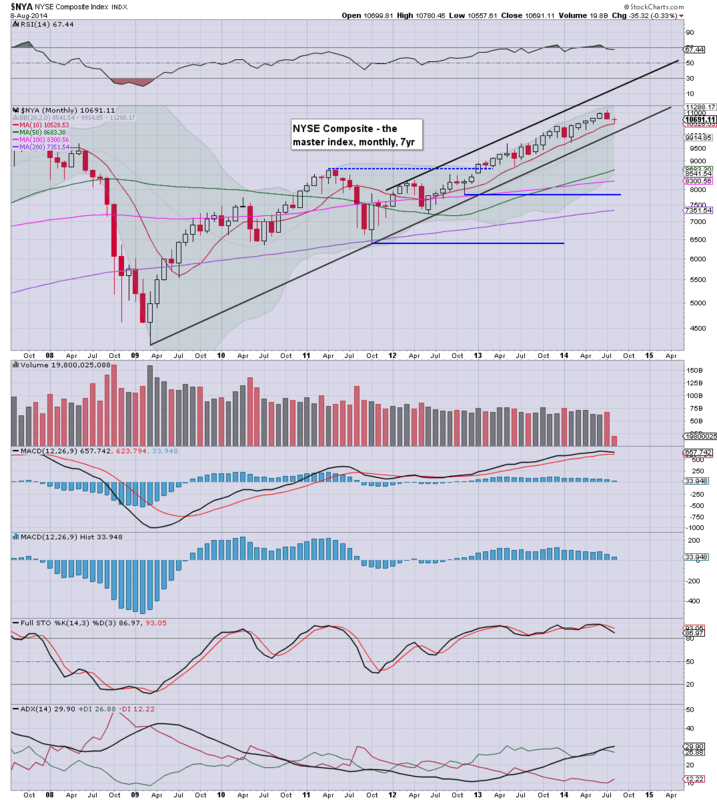 Under no outlook can I envision the Dow much below 14k in the mid term. In theory, there is viable upside to the 17500s in Sept/Oct, although with increasing geo-pol issues, I find another 1000pt gain in the Dow somewhat hard to believe. The master index is currently net lower for August, but the broader trend remains to the upside. Equity bears need to break below the 10MA of 10500s to have some 'moderate' confidence that a bigger multi-month down wave is underway. As things are, I'm still highly suspicious that we will yet see one final higher high... probably in the 11300s. The R2K is a rather surprising 1% net higher so far this month. Underlying MACD cycle is negative for a second month, and without question, the R2K remains the weakest of the US indexes. Key floor remains the 1080s, with a double top ceiling of 1212/13. Even if the sp' can rally into the 2000s in Sept/Oct, the R2K is going to find it tough to break new historic highs in the remainder of the year. The old leader remains the strongest index, and is comfortably way above the primary rising trend from 2009. 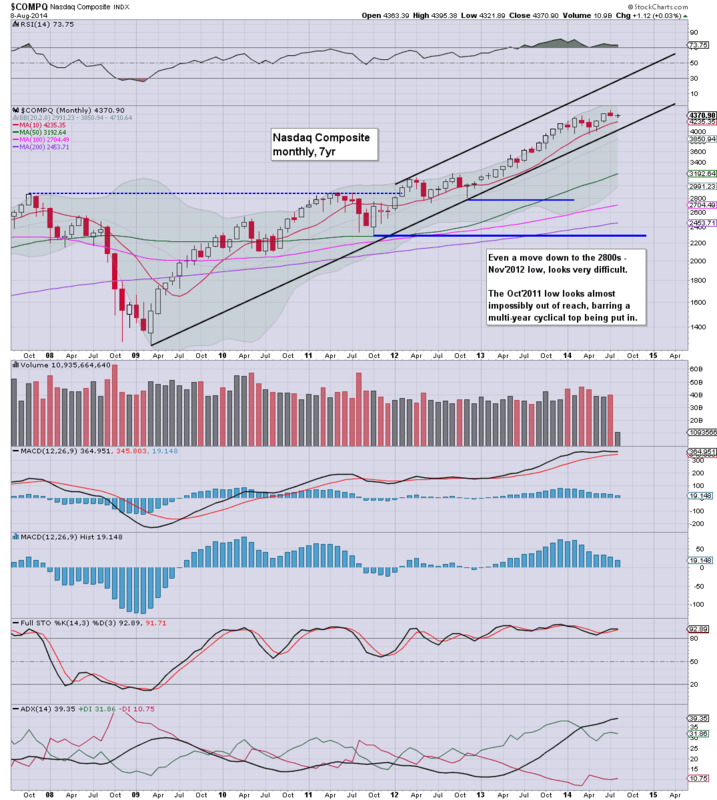 There is opportunity in Sept/Oct for the 8600s... which would make for a marginally higher high. Those equity bears who believe a major multi-month decline is close (or already in), should be seeking the 6500/6000 zone. The 6000s are of course a huge 20/25% lower, which would likely equate to the sp'1600s. The down wave from sp'1991 to 1904 spanned 11 trading days, and only amounted to a decline of -4.3%. 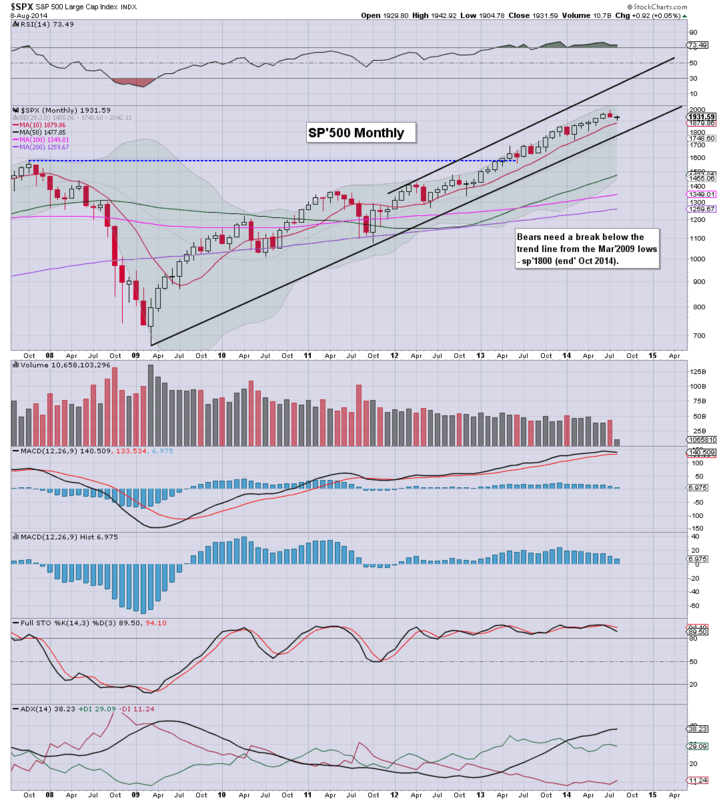 The Friday gains have certainly helped to improve the state of the monthly cycles. 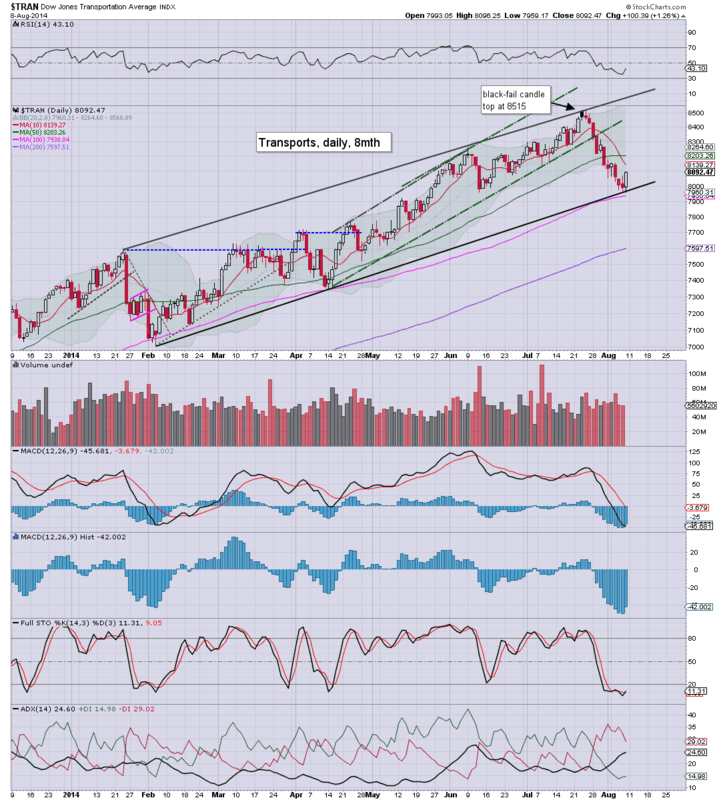 The R2K and Dow are both negative on the MACD cycle, whilst the 'old leader' - Trans, looks almost as strong as it ever has since the 2009 low of 2134. Just reflect on that for a moment... the Trans has effectively quadrupled in just five years. Most indexes are comfortably holding their broader upward channels, and for now.. the equity bears can't get overly confident that a key high is in. There is nothing particularly significant due next week. Fri' PPI, empire state, indust' production, consumer sentiment, with 1 fed official. 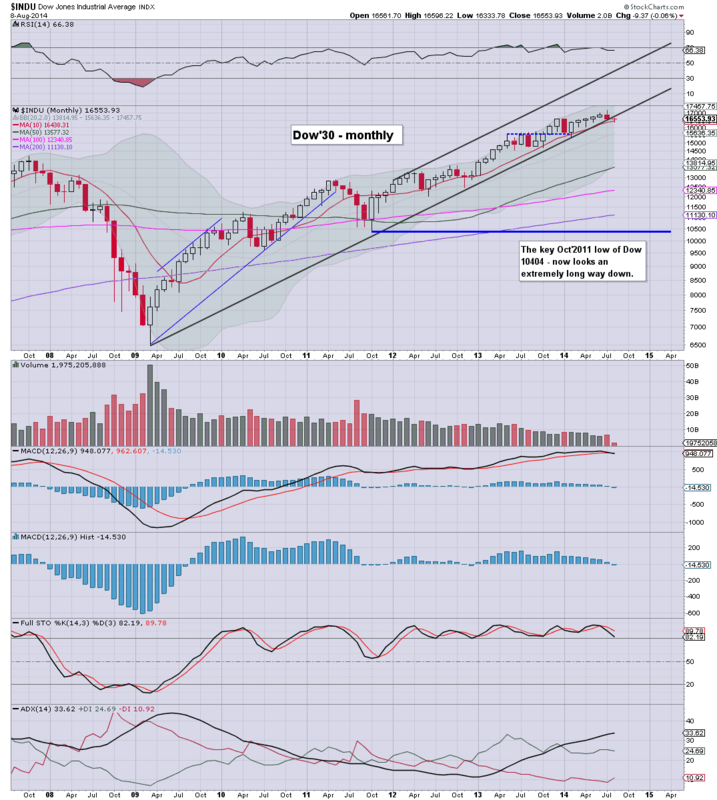 Can the equity bulls break back above broken support into the 1970s, and attain a new historic high, most notably.. through the giant sp'2000 threshold? For me, if I see the 1970s - whether next week.. or in late August, I'll assume the 2000s will be seen.. before this madness (from Oct'2011) finally completes. I am holding long across the weekend, and seeking an exit in the 1950/60s next week. Despite overnight futures (equivalent to sp -17pts at 1892), equities climbed into the weekend. 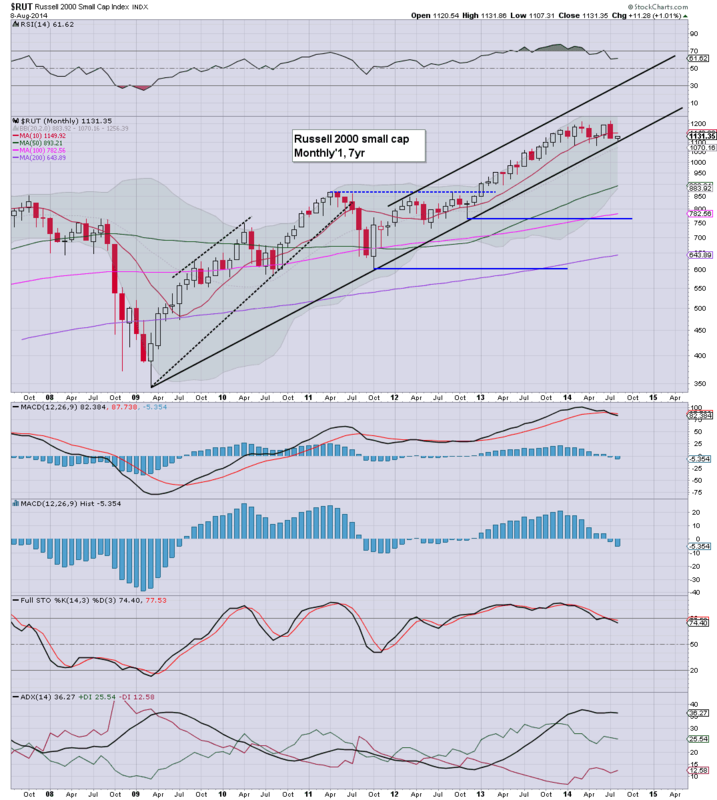 The sp'500 managed a net weekly gain of 6pts @ 1931. Far more impressive though, the R2K, settling higher by 1.5% @ 1131. It has been a very busy week, not least with all the comments/emails from some of you! We closed with a second consecutive red candle on the weekly 'rainbow' chart, something we've not seen since January. Certainly, it was a week for the bears, even though the market managed some significant Friday gains. Overall, it looks like we have broken the near term down trend. The big issue is will we get stuck... putting in our first lower high (probably <sp'1970)...or...can the giant 2000 threshold yet be broken in September? 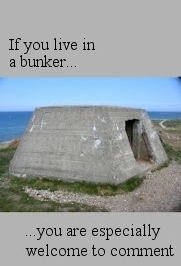 Right now... it is too difficult to guess. First things first.... lets see what the bulls can manage next week on a 3-6 day bounce/rally. *I hold LONG the indexes across the weekend. First, I should note, Mannarino has greatly annoyed me at times across the last year or so. I'm still suspicious that he drops key words (crash, collapse, etc) just to garner extra web traffic but I have to note, the guy is way more balanced than he used to be. His outlook is effectively the primary scenario that I currently favour (see chart weekly8b), where the 1991/04 decline was a sub'4 of 5.. and a fifth is now underway. 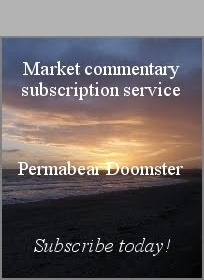 see article at seeking alpha. There are a number of reasons I could add about why October could be problematic for the US capital markets. However, for now, I think most investors should merely be mindful of the bigger monthly cycles that are rolling over, but more on that tomorrow. US indexes climbed into the weekend, sp +22pts @ 1931. The two leaders - Trans/R2K, settled higher by 1.3% and 1.0% respectively. 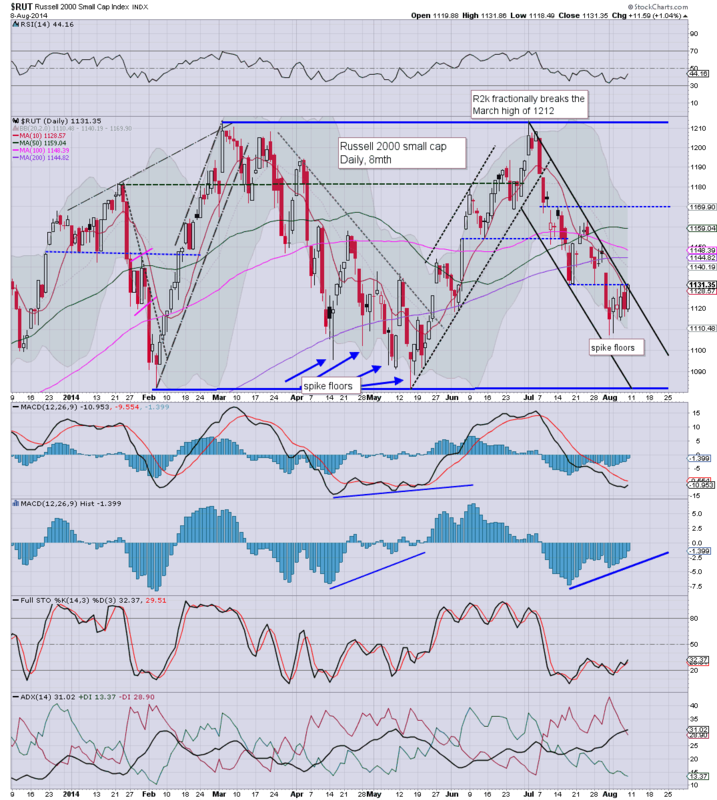 Near term outlook is for the sp'1950/60s, where there will be stiff resistance. 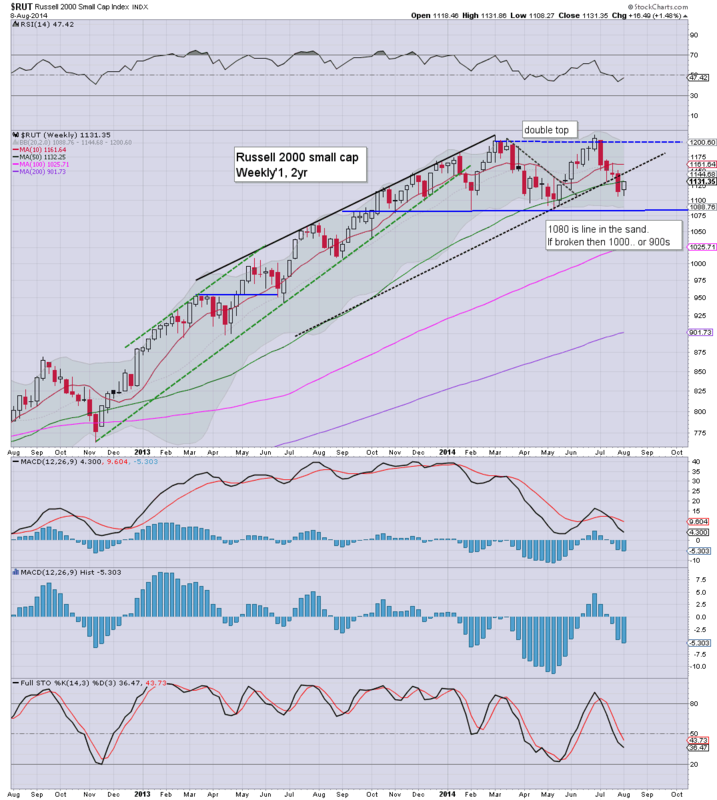 As a few noted this week, it was highly notable that the R2K was holding together very well. The fact the R2K managed net weekly gains of around 1.5% is especially impressive, considering the lower low of sp'1904. With the break into the 1130s, there is a borderline break of the down trend in the R2K... the door is now open to the 1160s next week. It will be tough to break 1170. Transports managed to hold the broader upward channel, and the issue now is whether new highs will be hit.. or whether we'll see our first lower high.